Fruit flies are sort of strange creatures. Every time they invade one’s residence it seems very hard to get rid of them. 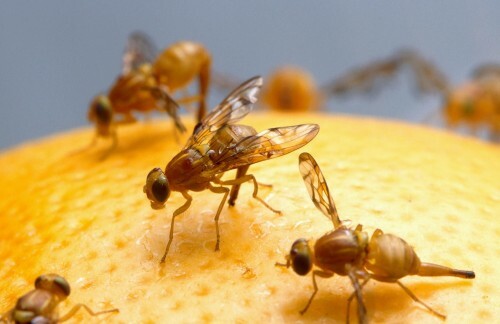 The simple methods to cope with fruit flies are getting rid of fruits, veggies, and other food items before they can become overripe, store cooked food items that are appropriately covered and seal the entire stored foodstuff in storage containers with air-tight covers. In the subsequent paragraphs, we are going to mention 10 ways to get rid of fruit flies in the house. You might not be familiar with this, yet recycling bins are able to turn into comfy fruit fly habitats, particularly if you don’t clean them up thoroughly all that frequently. 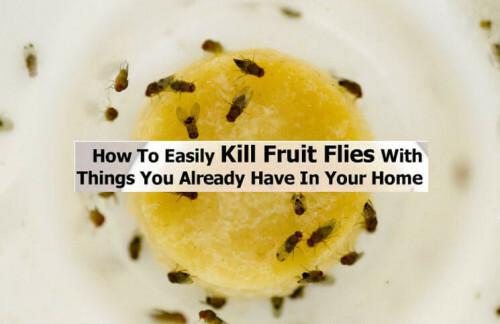 It is because the fruit flies enjoy living in locations where they are able to find anything sweet or perhaps fermented, and in case that place is moist as well, better yet. Therefore, if you can, get rid of any kind of vacant soda cans, bottles of wine, as well as beer bottles or containers laying close to your house because they are known to attract fruit flies. This might look like common sense for many of you, however, you really should never have decaying fruits laying in your home. They are not only vulnerable to luring fruit flies, but a number of other insects as well as harmful bacteria too. If you fail to simply remove these decaying fruit and veggies right away, put them in plastic bags for preventing them from letting out the aroma that many bugs use for guiding themselves towards them. Leaving behind food exposed on kitchen countertops is definitely an open invitation to the fruit flies. Not only does this include edible food items but also soiled dishes as well as the garbage dump. In case, you would like to eliminate fruit flies in your kitchen, store the leftovers fit for ingestion inside a fridge or in air-tight storage containers. Keep the kitchen thoroughly clean by wiping the countertops after each and every meal and disposing damp garbage like fruit and vegetable peels on a regular basis. Some individuals prefer to turn the kitchen scraps into compost and it is perfectly normal. The issue, nevertheless, is that not every individual remembers to clean up the compost bin regularly, causing the bin to become a habitat for fruit flies after some time. If at all possible, you need to take the compost bin outdoors till you free yourself of all the flies, or at the very least look for a better solution to cover it up. In case, you preserve storage of huge quantity of onions, potatoes or any type of vegetable, then be sure to review them every now and then. Even a single rotten thing, may help in increasing the populace of fruit flies profoundly. In addition, if you think the production of fruit flies are becoming uncontrollable, then it is far better to check out these storage areas because they are the most likely origin. Apple Cider Vinegar The fruit flies are not able to resist the odor of fermentation plus given that apple cider vinegar happens to be the fermented variation of apple as well as cider, they jump straight into them. To be capable of setting the trap, get a bottle and fill it with the vinegar. Then cover up the opening using plastic and also make a very small hole with a toothpick or maybe a needle on the plastic material. Wrap a rubber band all around the neck to maintain the plastic in position. By doing this, the fruit flies will surely get into the bottle but won’t be capable of escaping, therefore, will die within the bottle. Place these kinds of traps around locations of the house where their populace is large. By warming the apple cider vinegar slightly prior to filling the bottles, you will get a better result. The aroma gets stronger by doing this. Exactly like vinegar, the fruit flies are significantly interested in the scent of red wine. Therefore, simply by leaving behind a bottle of red wine in the open can easily create an excellent trap. As soon as these fruit flies get into, the slim neck of the bottle will not allow them to come out of it. If you would like, you can also tie up a plastic with a hole at the bottle’s opening to create the trap. Another reason of fruit flies infestation is actually filthy dishes. Some individuals would rather wash their dishes all at one time, or whenever they have the proper time available, so they will not be worried about a slightly unclean pan laying around. By not cleaning all your unclean dishes regularly, you enable moisture plus bacteria to set in, converting your filthy dishes into a fruit fly habitat. Many individuals have got slow-moving drains within the residence, but they do not normally worry too much regarding them till they need to cope with flies or any additional type of insect flying in their home. The thing is, most fruit flies reside and grow in damp conditions, and sluggish drains or faulty plumbing installations are fantastic for them in this regard. Therefore, if you are coping with fruit fly invasion, fix all the slow drains in your home. You will find racket obtainable in the market which can truly assist you in getting rid of fruit flies. This particular racket can perform the work extremely fast and also easily. Its mobile feature enables you to utilize it anywhere in your house. These days it is not that costly. The most important part is, the dead remains of the fruit flies stick to this device and diminishes with a crackling noise within a matter of seconds. Place a cover on the compost bins. Treat the drains using gel. Kill and remove all the trapped flies. Never panic and get perplexed. Do not keep the doors and windows open.